We all have tasks thrown into our daily routines that perhaps aren’t the most fun, yet are required to keep us powering through life each and every day. The point is, we all have those tasks we have to get through each day that we don’t necessary find joy in naturally. Maybe we’ve even come to dread them and let them hang over our heads in a way that puts a cloud over part of our day. But it truly doesn’t have to be that way! It is entirely possible to find joy in even the most mundane of tasks. Yes, scrubbing toilets – I’m lookin’ at you! 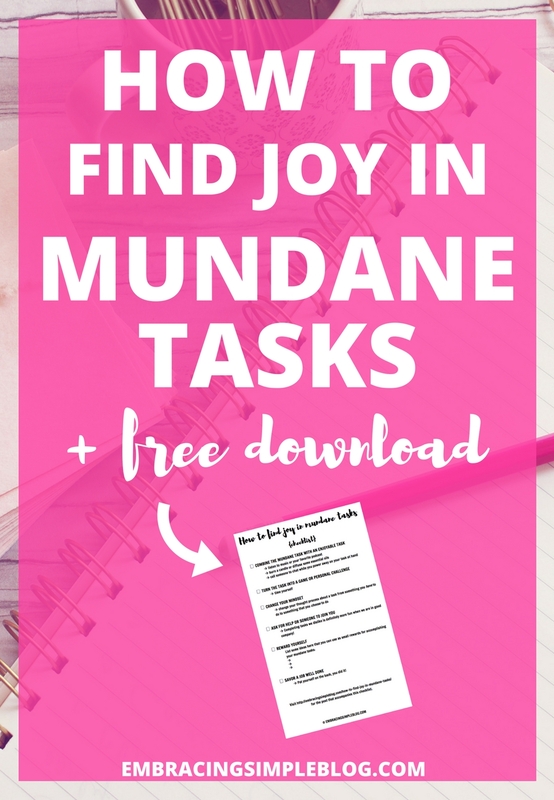 Today I wanted to share a few things that have helped me learn how to find joy in mundane tasks, and I hope you find them helpful to make your own dreaded tasks a little more enjoyable too! You're almost done! Check your email to grab your free printable. If your mundane task is one that doesn’t require a ton of focus, try combining it with doing something else you enjoy at the same time. Some ideas are listening to music or your favorite podcast, burning a candle or diffusing some essential oils, or calling up your best friend to chat while you power away on your task at hand. Find some way to make that task slightly more enjoyable and I can guarantee you might actually start looking forward to completing it next time! If it’s a task you truly loathe, try making a game of seeing how fast you can get it done. Cleaning bathrooms is probably my least favorite chore, so sometimes if I’m really struggling with not wanting to do it, I will set a timer and see how quickly I can get everything cleaned and tidied up. If you are someone who is naturally competitive, this might work for you too! It’s kind of fun to see if you can beat your own best time, and certainly makes the chore go by more quickly! Changing your thought process about a task from something you have to do to something that you choose to do instead can really help to have a more positive mindset about accomplishing it. Doing things we dislike is definitely more fun when we are in good company! An errand I personally dislike is grocery shopping. Funny enough, even though my 3-year-old and 1-year-old are usually complete crazies at the grocery store, having them with me makes the task a heck of a lot more fun for me. They get excited about going and being there whereas I’m just trying to get in and out as quickly as possible. So instead of going grocery shopping alone at night while they are sleeping, we usually make it a family outing on Sunday mornings and my husband and I take them together. It’s made the task of grocery shopping go from something I dread, to something I do find joy in just because it’s more fun to do with those I enjoy spending time with! Maybe when you’re faced with a whirlwind of doing dishes and cleaning the kitchen after dinner each night, you tell yourself that you get to savor a piece of dark chocolate for dessert or sit in peace on the couch for 5 minutes to relax when the cleaning is done. Having some type of reward to look forward to can definitely help you power through when you really aren’t in the mood! When you have finally finished the task at hand, be sure to savor the fact that you did it! It can feel really good to knock a task off your to-do list, especially when it’s one that you dread. Giving yourself the pat on your back you deserve can help you feel accomplished and maybe even less likely to dread doing the same task the next time. What’s a task you typically dread doing? Let me know in the comments below! Don’t forget to grab your free checklist! I don’t like to clean windows. It’s an helpful advice on turning Daily Chores into Daily Joys! Awesome and Inspiring one. I hate hate cleaning bathrooms! Thank you for your emails and posts! I do like your list above and may do #5 a little more. I also like to clean a little each day, so it’s not as overwhelming on the weekend. I try to alternate rooms on a weekly/ biweekly basis. I find keeping up with the mail daily too leaves to less papers clutter piling up. These are great! I use #’s 1,2 &5 all the time, to tackle the tasks I tend to avoid. I have to say, though, I never mastered the grocery store with my kids. It’s a task I don’t enjoy to this day, but I can remember savoring the few times I got to go without my kids while they were little as if it were a day at the spa. haha! yes. yes. yes! couldn’t agree more. it wasn’t until i started to cultivate an appreciation for the mundane that i really started to cherish the little things in life. for me, it all started with learning to love the simple sound of my breath. Literally the only thing that’s making me enjoy mundane tasks is me making a game out of it or singing while I work 🙂 good tips! This is such a great post! I have some mundane work tasks that I absolutely dread so for me its not cleaning or home chores but work but since I work from home I am able to combine music into work to make it bearable and that way I also do not realize how much am getting done until I finish them, I also like to reward my self every now and then, I find that it works for me too so I can just tell my self that I have a cup of ice cream or see a movie if I finish up with this task. Lol! Thank you for writing this. Podcasts and music make all of my housework better! Washing dishes and cleaning the bathroom feels less like a “waste of time” when I’m listening to something educational at the same time. I'm Christina, and I'm passionate about practicing intentional living and helping others do the same.